Home > Garden Plants > It's Magnolia Season! This time of year I find myself outside amongst pink and white tepals bursting forth on bare branches and floating in a gentle breeze over fresh, green, spring lawns. 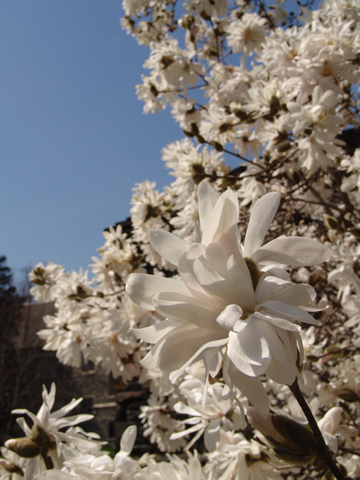 The first magnolias to bloom at the Scott Arboretum are the Magnolia stellata cultivars, M. kobus and M. salicifolia. A few weeks later and finishing up this week, Magnolia denudata, M. ‘Candy Cane’ and M. x loebneri selections contribute to the symphony of color and fragrance. The Magnolia x soulangiana cultivars are in full bloom this week as well. 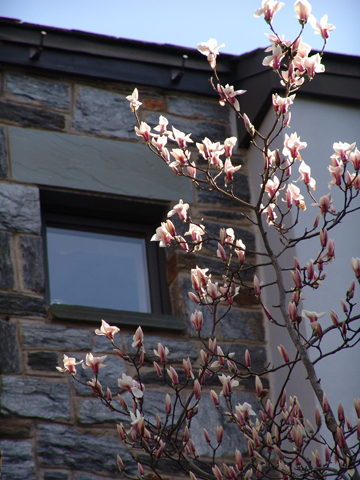 I am praying we don’t get a late spring frost anytime soon that could shorten the magnolia display. 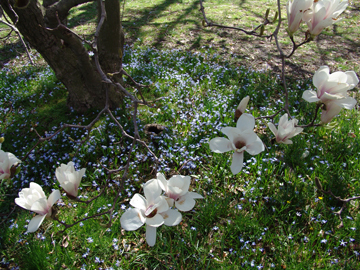 In the Magnolia Collection near Mertz Residence Hall there is a supporting ground layer of blue Scilla siberica, and white and purple Crocus cultivars found under their branches. Next week should be peak bloom for the Little Girl Hybrids and M. ‘Spectrum’ and ‘Galaxy’. The yellow magnolias are just starting to swell and will contribute to the finale in May just as many American native magnolias come into bloom. We have 266 specimens of magnolias representing 165 taxa in our collections at the Scott Arboretum; many of them are mature specimens. But their importance goes beyond their inherent beauty. 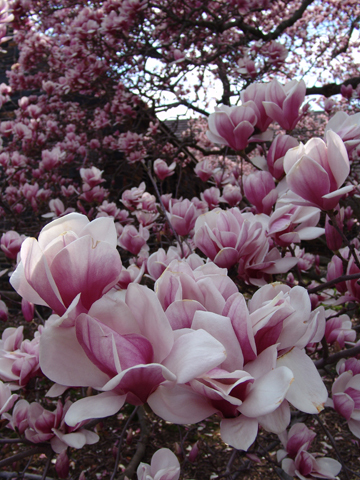 In 2007, BGCI (Botanic Gardens Conservation International) and FFI (Fauna and Flora International) jointly published The Red List of Magnoliaceae which identifies 131 wild magnolias as being in danger of extinction, from a global total of 245 species. The report called for action to ensure that the 89 taxa listed in the report as Critically Endangered or Endangered were conserved. The first stage of this action was to establish which of these taxa are held in ex situ collections around the world by carrying out a global survey. The Global Survey of Ex situ Magnoliaceae Collections published in June 2008 identified 2,274 Magnoliaceae records from 238 institutions in 47 countries. However, only 362 ex situ records representing the 37 of the most threatened Magnoliaceae were located. This means that more than half of the Critically Endangered or Endangered taxa are currently not known to cultivation and therefore at great risk of extinction if threats that they are facing in the wild are not addressed. The significance of this potentially catastrophic loss lies not only in the threat to the genetic diversity of the family, but also because they are a highly sensitive indicator of the well-being of the forests in which they are found. 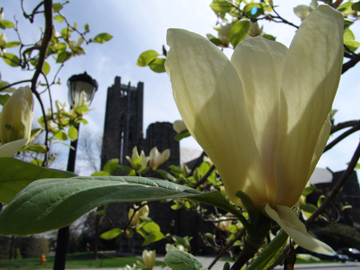 Magnolias are among the most ancient groups of flowering plants and have long been cultivated by mankind. Some specimens growing in the precincts of Chinese temples are estimated to be up to 800 years old. Still popular as ornamental plants in gardens around the world (although fewer than 15 species are common in cultivation), in the wild magnolias are a source of timber, food and medicines for local communities. Besides being an intuitional member of BGCI, The Scott Arboretum participated in this survey and found our collections to rank 23rd in the world out of the 238 participating institutions. The survey did not include Magnolia hybrids or cultivars since the survey aimed at evaluating the value of ex situ collections towards the long term conservation of wild populations. Take a tour of the Magnolia Collection with me on Wednesday, April 15 from 5 to 6:30 pm and learn how you can cultivate magnolias in your garden. Oh, how I wish I could!!! Lovely Magnolias! What a tender colour, like an ice-cream.